The single best way to get into racing, like many other things, is to start at an early age. In 2017 we will, again, be competing in the Canadian Rookie Karting Championship held at Goodwood Kartways in Goodwood, Ontario. We are considering whether to compete at Canadian Tire Motorsports Park (CTMP), formerly Mosport Intarnational Raceway, as well. Introducing another track to the shedule offers many great advantages and both tracks are rich with history and offer unique challenges. CMTP offers a slightly more technical aspect to racing with it's tighter corners and various track elevation changes. 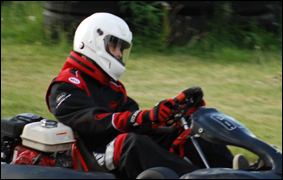 Goodwood Kartways is one of the oldest continuously operated kart racing facilities in North America and home to world-renowned international drivers including Ron Fellows, Paul Tracy, and Scott Goodyear among many others. 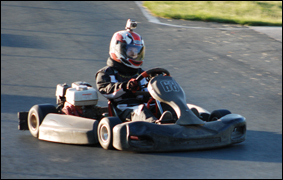 We are looking forward to another very exciting year of competitive karting at Goodwood this year. Christiansen Racing highly recommends Goodwood Kartways, but we will warn you; it can be addictive! Feel free to join us trackside for any of the posted karting events, from practice sessions to races. Practice sessions may be held on any day of the week and at any time (check driver schedules for details), however, all regular season races are at 7pm and we usually arrive at the track around 5pm to prepare for qualifying. We will also be publishing many of the team's races from our driver's perspective on YouTube™ when time permits, however, we will be providing real time updates on qualifying sessions and races via Twitter. The Karting Team loves it when friends and family come to watch the races, however, if you can't join us at the track, follow us on Twitter and stay current in real time. Here's a video from our Twitter feed of Bjorn's first time at Goodwood Kartways. This video was taken back in 2008 and we've posted a short clip of it for fun to have a look back at what the track used to look like. Wow - what a diference! 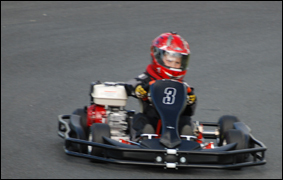 Snapping around in the family rental karts gave Bjorn the bug and he hasn't looked back since!